Designed for Chrysler 340-360 engines and 318 engines with 340-360 cylinder heads. Accepts 1975 and earlier waterneck only. 1979-Up rotary A/C compressor will not clear waterneck. Will not accept stock Thermo-Quad carburetor. Will not fit 1992-Up Magnum engines. Includes nitrous bosses. No provision for exhaust-heated choke and no exhaust crossover. 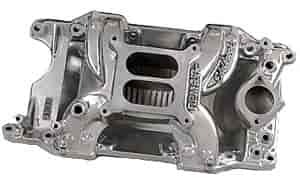 Port exit dimensions: .98"x 2.16"
Carb pad height = 5.35'' Click here to determine carburetor pad height.